“A meeting of the Trustees was held at the Asylum, Anglesea Street. This Institution was founded for the purpose of helping Old Ladies, who had seen better days, by providing them with a home and sustaining them as far as the means at the disposal of the Trustees would permit. Each inmate has a little room to herself, and gets a small weekly allowance for food, but on account of the increased cost of all necessaries, the Trustees found, with regret, that it is not possible to admit the full number of applicants for which there is room accommodation” (Cork Examiner, 5 February 1919, p.2). On any given day within the Cork Examiner from one hundred years ago, the news is diverse. One institution, which receives passing references is SS Joachim and Anne’s Asylum. 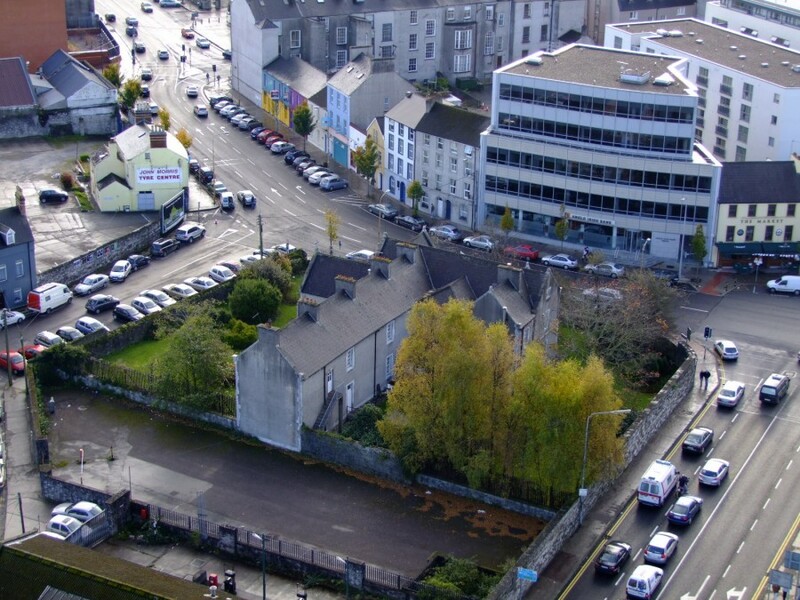 The old beautiful building has survived the test of time on Anglesea Street and is now in the guise of homelessness accommodation amidst the backdrop of a changing skyline in the City Hall and Cork’s Docklands quarter. The Buildings of Ireland project notes the building’s importance for retaining its “intactness, original street boundary walls and railings, gardens, as well as building fabric”. Unfortunately, a limited amount of historical material survives for the story of the building with little or no documentation surviving for residents. Founded by bequest by John Lane for Roman Catholic girls in 1843, the original and temporary premises was on Rutland Street. 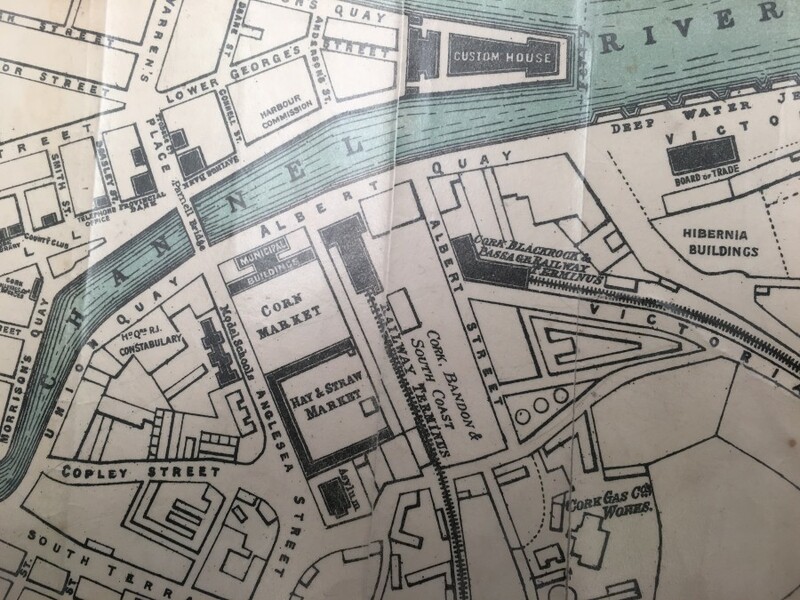 In January 1854, a call was sent out in the Cork Examiner by the Trustees of SS Joachim and Anne’s Asylum for Distressed Gentlewomen, seeking building ground. All proposals were to be sent in to Paul McSwiney, Secretary. They wished to receive proposals “for a Site, within the city, “of about 60 to 70 Feet Front by 120 Feet Deep, for the purpose of erecting a new asylum”. A space was chosen behind the City’s corn market on Anglesea Street and rented from a Mr Wise. In February 1855, the trustees invited architects “to furnish with sections and in lines plans of a new Asylum”. A premium of £5 sterling was to be given for the plan approved of. The successful architect was Henry Hill. According to the Dictionary of Irish Architects, Henry Hill was born in Cork in 1807, the second surviving son of Thomas Hill and a younger brother of William Hill who also became an architect. Henry may possibly have gained some of his architectural training in England. He was in London from at least January 1826 until early 1827. He left London on 27 January 1827 and arrived in Cork. He designed with his brother William, the Corn Exchange (now the site of Cork City Hall) on Albert Quay, the Old Queen’s Old Castle, c,1835 for William Fitzgibbon and he was architect on Cobh Presbyterian Church, completed in October 1855. 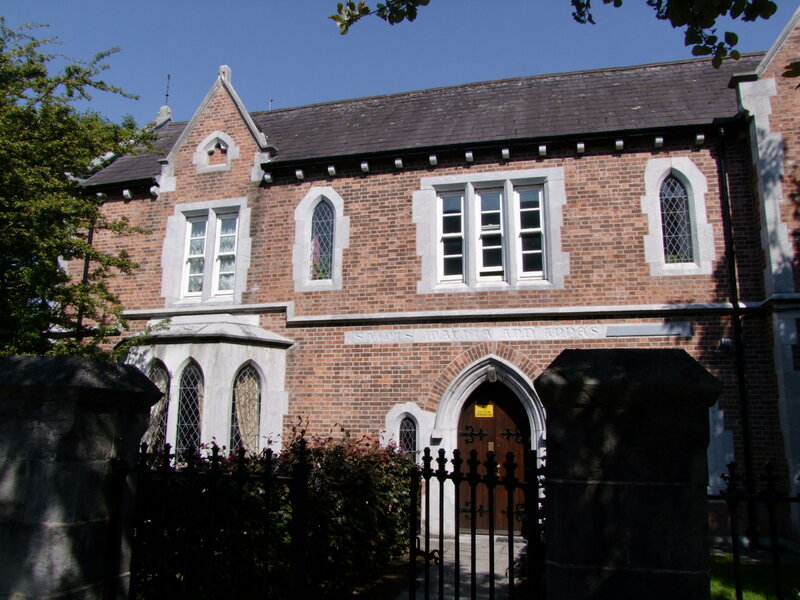 An article in the Cork Examiner for 12 November 1858 highlights that the exterior portion of SS Joachim and Anne’s was nearly finished through the building work of Samuel McMullen at a cost of nearly £2,000; “it is a handsome and tastefully designed structure of the old English style of architecture, and when it is completed, it will be, perhaps, the greatest of the improvements that are in progress in that locality. The materials used are the best Bridgewater red brick – the Cork Brick Company, having been ready to supply when the work was commenced – with cut stone dressing, and the effect of the whole, including the fancifully designed windows, is striking and very pretty”. The news report further details that the accommodation provided was for twenty inmates; “there is every requisite that may be said to constitute a comfortable residence, but should the funds be increased by bequests, subscriptions, or otherwise, so as to enable them to support a large number, the building will be proportionally enlarged. There is also a small chapel attended for the use of the inmates”. In 1919, apart from SS Joachim and Anne’s the City had several asylums, homes and houses for impoverished women and men from Roman Catholic and Protestant backgrounds. Skiddy’s Almhouse (est.1715) in St Anne’s Shandon Churchyard was for aged females, Protestant and Catholic. The Asylum for the Industrious Blind on Infirmary Road was established in 1843. Lapp’s Asylum on Western road was founded in 1856 for aged and infirm people of the Protestant faith. The charity supported sixteen aged and infirm Protestant ladies in the Asylum and assisted twelve more ladies and gentlemen in their own homes with a weekly allowance. Bretridge’s Charity was founded 1685, for the maintenance of seven old soldiers. It merged in the City of Cork Church School Board. Residents of St Mary’s and St Anne’s Shandon. The Green Coat Hospital was endowed in 1720 with a school and almshouse and provided for impoverished and aged Protestant housekeepers of the Parishes of St Mary’s Shandon, St Anne’s Shandon and St Luke’s, Cork. Across in Montenotte the Honan Home (under a Royal Charter and Board of Governors) was founded and endowed in 1896 by the Mathew Honan for twelve impoverished and aged gentlemen from the city and county of Cork. The Home for Aged and Destitute Men and Women in Montenotte was under the care of the Little Sisters or the Poor whilst the House of Mercy at St Marie’s of the Isle was a home for destitute girls.